"Slime for Clouds" is the first dream I had in advance of taking the picture. It was also the first dream I ever had that was just an image -- no story, no narrative of any kind, just an image that included two green clouds above a familiar seascape. 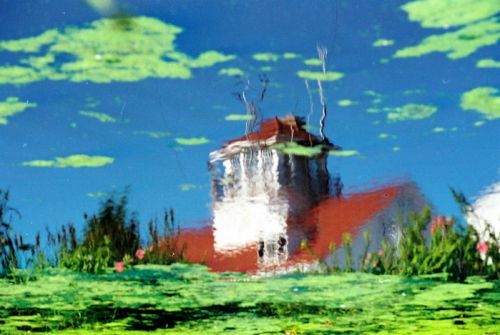 The dream made no sense until one day, a few months later; I was shooting a picture of the Coast Guard Station reflected in a pond that had algae floating on top. The algae formed two perfect clouds that swam into my lens. I later recognized them from my dream but I took the picture when the red roof turned to velvet against my skin and the white shingles felt as soft as Santa’s beard. This image is included in Patricia Lynn Duffy's wonderful book Blue Cats and Chartreuse Kittens. I named this for my artist friend Ellen McLuskey who is a pastel painter; my photograph reminds me of a pastel she might have painted. I watched the water until the pink turned to satin against my skin. When I felt the circles dilate as they formed and reformed, I became one with the motion, and then free of thought, I snapped the shutter. A few days later, I came upon a postcard that gave me a jolt of recognition and excitement, for the painting on it looked just like my image –- archetypically, anyway. When I turned it over and saw that the artist was Kandinsky, my only question was whether he had the same form of synesthesia as I.